A highly unusual online exchange took place on Twitter between the prime ministers of Greece and Turkey before the former deleted his tweets - but only from the English version of his account. The official English-speaking account of Greek prime minister Alexis Tsipras (@Tsipras_eu) posted four tweets addressed to his Turkish counterpart Ahmet Davutoglu, needling him about Turkey's downing of a Russian jet and Turkey's violations of Greek airspace. "Our pilots are not mercurial as yours against the Russians" Tsipras tweeted. Tsipras said the two countries should focus on saving refugees, not on weapons. "Comments on pilots by @atsipras seem hardly in tune with the spirit of the day. 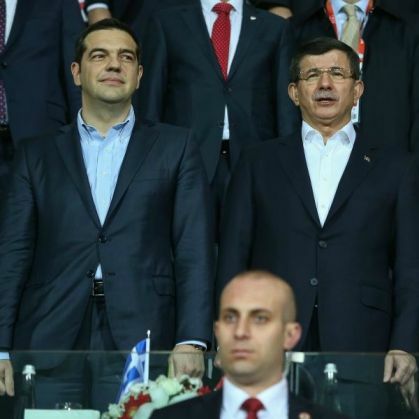 Alexis: let us focus on our positive agenda," @Ahmet_Davutoglu responded. The two are attending an EU-Turkey summit on refugees in Brussels.